Published by Black Dome Press, Delmar, New York, $24.95. 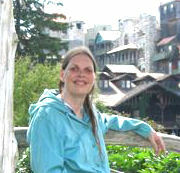 at the Mohonk Preserve, the Mohonk Mountain House, online at Amazon, Barns and Noble--and booksellers everywhere. Read about his remarkable life. "The Shawangunk Mountains of New York's Ulster County are a protected region of stunning natural beauty, with hundreds of acres under the stewardship of the Mohonk Preserve and the Minnewaska State Park Preserve. The range is "one of Earth's last great places" and a hikers' and rock climbers' paradise, but it was not always this way. From early post-Revolutionary days through World War II, a few hardy families scratched out a living atop the mountain, defying an unforgiving and isolated terrain. For generations they lived off the land, working subsistence farms and harvesting raw materials from the forest and earth. "Today only a few vestiges of this proud and independent community remain. The rest has vanished along with the way of life that sustained it, but in the pages of this book Robi Josephson and Bob Larsen breathe life into this lost world and the people who once called it home. This long-awaited work, the result of their combined 50-year odyssey and Larsen's groundbreaking research, tells the remarkable story of the Trapps people and how the hamlet was honored with placement on the National and State Registers of Historic Places--the first time New York State has recognized the historic importance of a vanished, hardscrabble community. "Without this detailed and compassionate book, it is difficult to imagine life on a "scratch farm" on the rocky slopes of the Shawangunks. Only a few generations ago, our ancestors could "live for a long time without going to the store for fruit, vegetables, meat and supplies." These are people who truly define pioneer spirit, tenacity and grit. In a very substantial piece of work, Josephson and Larsen bring their vanished lifestyle back in full color, giving us more insight into the Gunks landscape today." "An Unforgiving Land is fascinating! The layout, the introductions to each chapter, the photos, the list of resources, and most of all the details about the people who come alive on your pages,make this a very important historic document of this region. 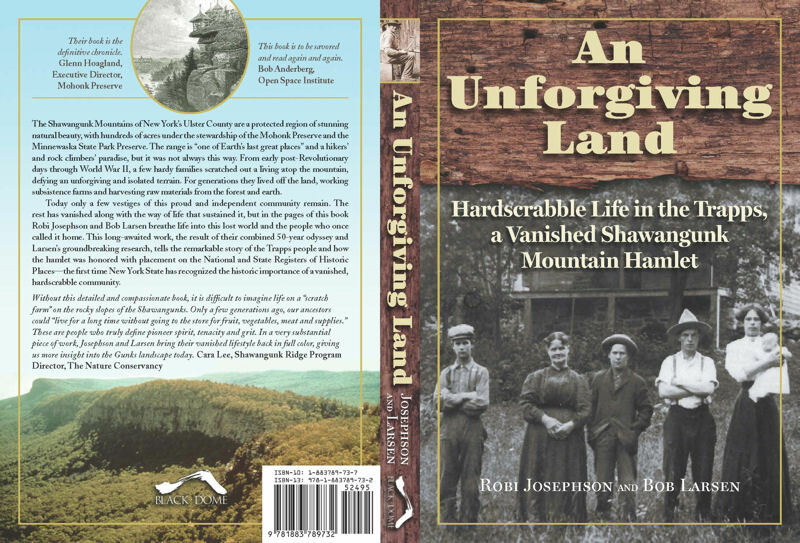 "The Cragsmoor Historical Society would be proud to be the first Cragsmoor organization to host a book talk and signing of An Unforgiving Land. We are not open in the winter, but we would like to schedule something for May 2014. By that time we will have our Journal out with an article about the book and another about the similarities between the Trapps hamlet and Evansville, which preceded the art colony of Cragsmoor at this end of the ridge..."... Congratulations to both of you on this brilliant accomplishment." "For three decades I taught a graduate seminar at SUNY-New Paltz entitled "Literature & Lore of the Hudson Valley"...Many fine writers came out of my place-seminar over the years, but the best place-book and the work that best embodies the vision of that course is An Unforgiving Land, by Robi Josephson and Bob Larsen (Black Dome Press, 2013). Robi Josephson was a star student in my Hudson Valley course and I'm glad that, many years ago, I urged her--even though I am a Faulkner specialist--to abandon the notion of doing an MA thesis on Faulkner and apply her talents and vision to local things, to Hudson Valley subjects. If I still taught that Hudson Valley seminar I would most certainly use An Unforgiving Land as a textbook for that course. As things are now, I continue to lecture around the country and the world on sense-of-place subjects and this volume will now serve as an example of what I mean by Sense of Place... Robi Josephson and Bob Larsen (and Black Dome Press) have produced a splendid volume, elegantly written, well-documented, and accompanied with scores of valuable photographs and illustrations. Any reader who wishes to cultivate the sense and the Spirit of Place should get this book--now! "Great job, Robi--I'm truly proud of you." "The authors do a superb job of capturing what it was like to live at the top of the 'Gunks. The life was tough, with poor soil for farming, the hazards of being far from medical care if injured, and the difficulties of living in winter. And yet the older settlers...loved their independence, the way neighbors helped each other, and the beauty of the mountaintop." and Steve Hoare, publisher, Black Dome Press. Arcadia Publishing is an imprint of Tempus Publishing, Inc. Books are available at the Mohonk Preserve, the Mohonk Mountain House, and at bookstores everywhere. "Mohonk is a name of Native American origin first given to a lake high in the Shawangunk Mountains of Ulster County. Mohonk Lake was sculpted eons ago by the crushing weight of advancing glaciers. Nature's handiwork resulted in a crystal blue lake rimmed by stately hemlock trees and sheer conglomerate cliffs. Mohonk Mountain House was established at the lake in 1869 by Quaker twins Albert and Alfred Smiley.They and younger half-brother, Daniel Smiley, created a mountaintop haven for their guests--a 251-room hotel set on acres of woodlands and gardens. Today Daniel Smiley's descendants welcome visitors to the last of the grand Victorian hotels in the Shawangunk and Catskill Mountain region. "The Mohonk Preserve was carved from lands of the Mountain House beginning in 1963 and bears witness to the vision of the Smiley family. Its mission is to protect over 6,400 acres [8,000 acres as of 2013] of semi-wilderness through its education, research, and land stewardship programs. Today, it is the largest nature preserve supported by members and visitors in New York State. 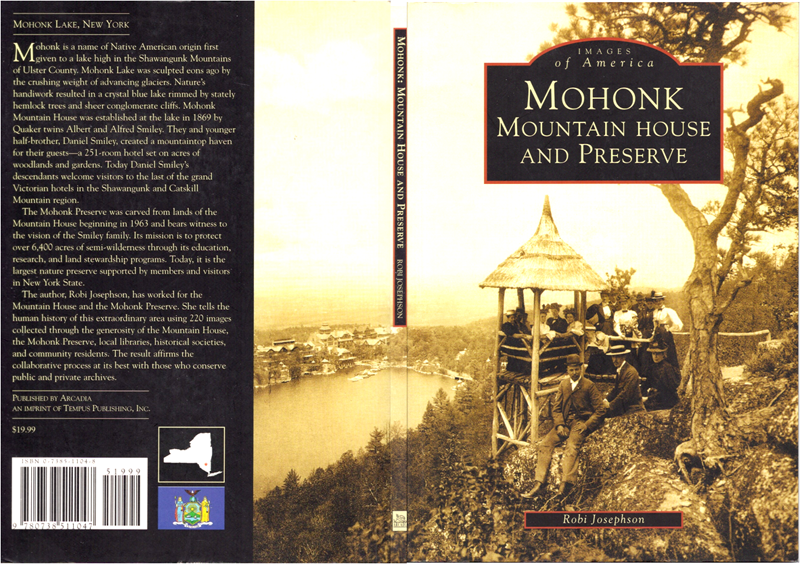 "The author, Robi Josephson, has worked for the Mountain House and the Mohonk Preserve. She tells the human history of this extraordinary area using 220 images collected through the generosity of the Mountain House, the Mohonk Preserve, local libraries, historical societies, and community residents. The result affirms the collaborative process at its best with those who conserve public and private archives." 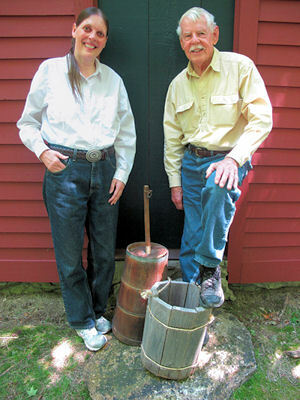 "Trapps Mountain Hamlet Historic District," by Bob Larsen and Robi Josephson. This article revises and replaces the Wikipedia article about the Trapps Mountain Hamlet. October 1, 2013. This revision is based on new research and findings. "Pondering the Mysteries," by Robi Josephson, Ridgelines, The Quarterly Newsletter of the Mohonk Preserve, No. 128, 2001. "Remarkable Journeys," by Robi Josephson, Ridgelines, The Quarterly Newsletter of the Mohonk Preserve, No. 126, Winter 2001. "Dramatic Changes to the Land: From Wilderness to Cleared Farms to Nature Preserves," by Bob Larsen & Robi Josephson, Ridgelines, The Quarterly Newsletter of the Mohonk Preserve, No. 123, Spring 2000. The Editor's Corner: "Sticking Together," by Robi Josephson, Ridgelines, The Quarterly Newsletter of the Mohonk Preserve, No. 118, Winter 1999. The Editor's Corner: "Return of the Natives," by Robi Josephson, Ridgelines, The Quarterly Newsletter of the Mohonk Preserve, No. 117, Fall 1998. The Editor's Corner: "'Ode to Joy', Part II," by Robi Josephson. Ridgelines, The Quarterly Newsletter of the Mohonk Preserve, No. 116, Summer 1998. The Editor's Corner: "'Ode to Joy'," by Robi Josephson. Ridgelines, The Quarterly Newsletter of the Mohonk Preserve, # 115, Spring 1998. The Editor's Corner: "Winter's True Beauty," by Robi Josephson. Ridgelines, the Quarterly Newsletter of the Mohonk Preserve, No. 114, Winter 1997-8. The Editor's Corner: "That "Wondrous" Kindness," by Robi Josephson. Ridgelines, The Quarterly Newsletter of the Mohonk Preserve, No. 113, Fall 1998. The Editor's Corner: "Rites of Passage," by Robi Josephson. Ridgelines, The Quarterly Newsletter of the Mohonk Preserve, No. 112, Summer 1997.